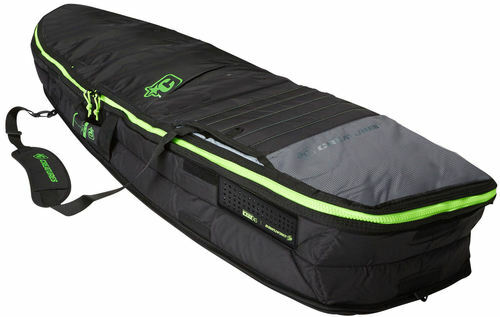 5	stars -	"Review for Creatures of Leisure Fish Double Charcoal Lime" Mark Taylor This Creatures of Leisure Fish Double Charcoal Lime is the best Covers Multi boards I have tried. The ultimate surf travel solution.Creatures latest innovations have combined to create the strongest, lightest, most reliable board covers in the world. Diamond-Tech Fabric™[ custom-made inter-woven dobby fabric ] lighter, stronger, more durable. resistant to uv degradation, stable in high temperature ranges & has a hydrophobic waterproof coating. Marine Grade Corrosion Resistant-Nylon Zipper heavy duty nylon zips, reliable & hard wearing. X-FLOW Air Ventilation System [ air ventilation system ] removes trapped humidity & moisture. EVA Reinforced padded carry handle with neoprene lining on the underside for added comfort.